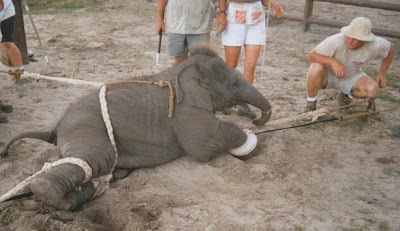 Pulled to the ground by a web of ropes, a baby elephant learns the hard way how to become a circus performer. 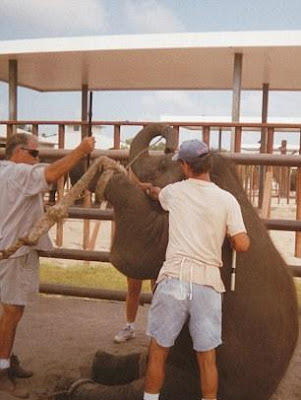 In case the youngster doesn't want to co-operate, a trainer stands by with one of the sharp metal hooks used to manage the animals. 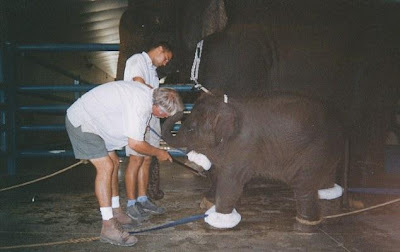 The disturbing picture is one of a series taken by a former trainer which campaigners say reveal the brutal reality of how elephants are prepared for circus work. 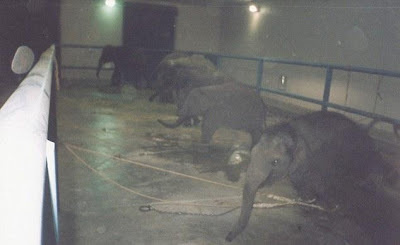 The pictures show them being dragged to the ground by ropes, chained side by side, pinned down by a hook in the back of the neck and checked by cattleprods. 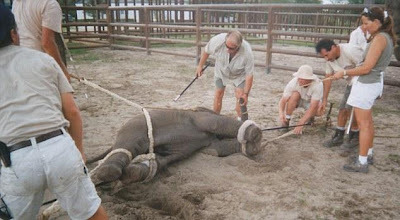 Peta - People for the Ethical Treatment of Animals - say the elephants are also separated from their mothers by force. 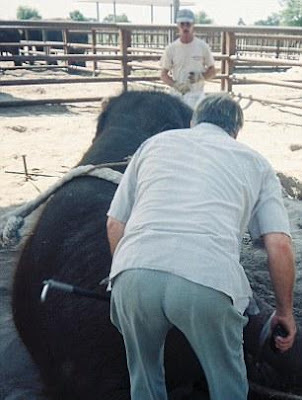 The photographs are being used to spearhead a campaign to tighten up laws on the use of wild beasts in circuses. 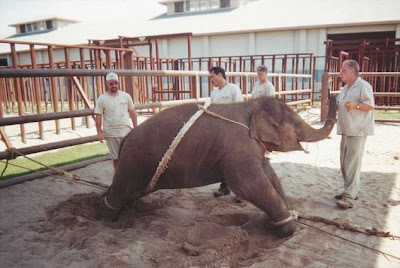 The Government here is considering legislation to impose stricter conditions on their care, training and performance, particularly where young are concerned. 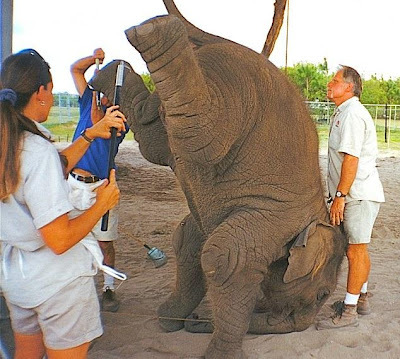 The pictures were taken in the U.S. by handler Sammy Haddock, who worked for the Ringling Bros' Barnum and Bailey Circus until 2005. 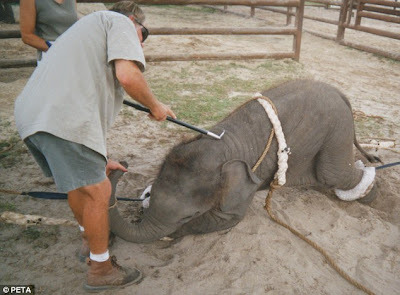 They were taken more than seven years ago - but Peta says such methods are widespread, and 'effectively amount to the torture of defenceless animals'. 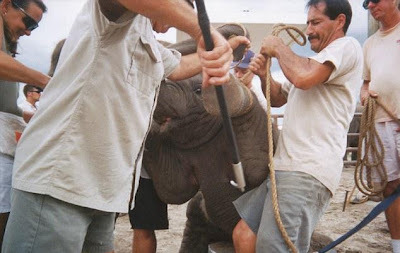 Haddock died last month and asked Peta to use his pictures to ease his conscience about the kind of treatment he administered during eight years at the Ringling centre in Florida. 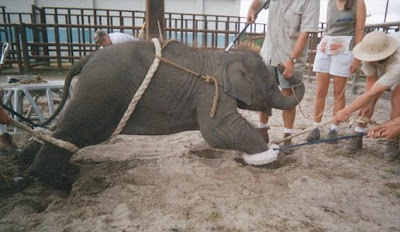 Ringling's dismisses Peta's claims as 'from the last century' and denies cruelty. 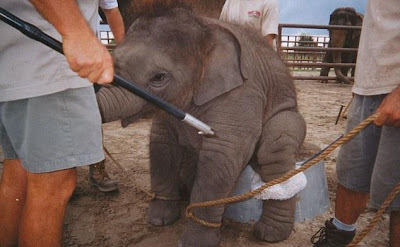 It says it separates calves from adults only when they are old enough to demonstrate natural independence.